The Viking wooden beard comb is unique beard comb for Scandinavian design elements. In the center is depicted the god Odin, under them dracara with heads of crows inscribed in the shape of the shape of the mustaches. 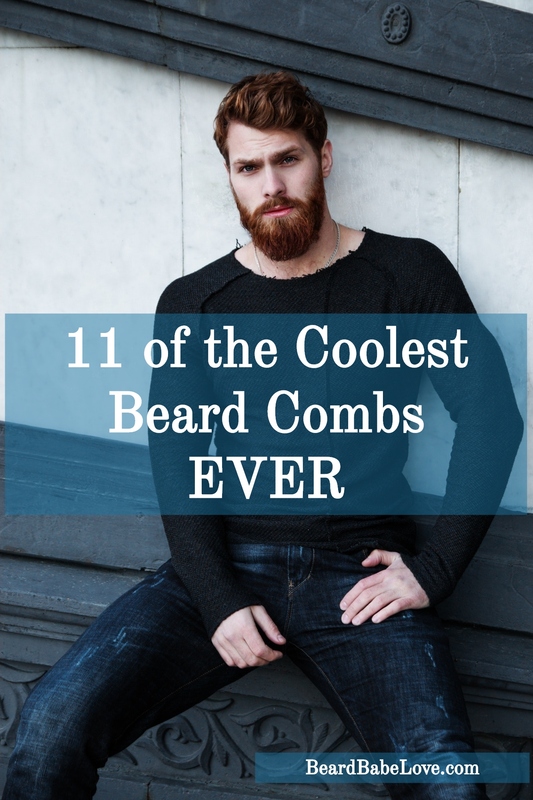 Made from natural wood, lightweight, comfortable, pocket-sized, perfectly combing beard. Size” 7 X 5 cm. This big Vegvisir wooden comb will be a perfect gift for Your father, boyfriend, lover, husband and any living who wears beard. Vegvisir, also known as the runic compass or the Viking compass made of eight Viking rune staves, is a symbol of protection and guidance believed to be used as a compass by Vikings. The word vegvisir means ‘wayfinder’ and ‘sign post’ in Icelandic language. Made of sustainable oak wood and finished with organic oil (that doesn’t cause allergy) to protect wood from moisture and dust. A new unique comb from the Esoteric Market. It is filled with an ancient sacred Scandinavian meaning. With patterns and a magic symbol – Valknut. This listing is for a set of combs; one large one and one small one; the smaller comb hangs from a stainless steel key chain and will come with the same wood options that are chosen for the large comb. Both will have tortoise shell acrylic “blades”. This is a pair folding beard combs; it has been laser cut from an original design meant to mimic a retro switchblade when closed. This design features engraved sugar skulls. It features an acrylic “blade”; with fine teeth to allow some precision while grooming your facial hair. The body of the comb has a laser-engraved texture for an old-school look. The wood body shown is walnut, both body and comb are finished with organic beeswax. Closed, large comb measures around 4″ x 1″; smaller comb is about 2″ x 3/4″. There is a choice of woods available for the body of the comb: Alder, Cherry and Walnut. Acrylic blades that are laser cut are always going to be a better option than a generic, stamped, plastic comb. Plastic combs stamped from molds, more often than not, will have jagged edges to the tines and this can damage your hair. Both the body and comb parts are laser cut for a smooth finish. The wooden aspects are then hand-sanded in a multi-step process to smooth and even them out, then polished and buffed with a mix of organic mineral oil and beeswax for a smooth, non-glossy finish. Each of our items comes tucked in a small, fabric pouch, securely packaged in a gift box, then further padded to prevent damages while shipping. This horn comb is designed to comb the beard or mustache and hair. It represents a castle. This comb will be a great gift and can be personalized by an engraving. (Consult us) On the same theme discover the large bow tie and the Roman legion helmet, the roman helmet, the imperial crown, crown, mustache Dupond & Dupont, the Russian revolver. The brilliant idea to incorporate several handy tools into one easy-to-carry device dates back to the ancient Romans. They ended up building roads and conquering most of the known world, so they were probably onto something. This unique beard comb is crafted with hardwood scales which can be personalized with your favorite initials, nickname, or monogram. The piece has two bamboo combs (a wide tooth as well as a fine tooth) that conveniently flip out to properly groom your entire beard and are appropriate for different phases of whisker growth. There’s also a handy bamboo knife to scoop out a healthy dollop of beard balm, so you don’t get it all under your fingernails, which is where you should be keeping grease and sawdust. The smooth hardwood handle swivels 360 degrees, like a straight razor, to hit hard-to-reach areas and allow use with either hand while ensuring a handsome and healthy beard. Easy as 1-2-3! Beardcomb made from oak, and polished by special wax. It’s fully handmade thing. ✓ This comb you can use for hair, beard and mustache. It’s a great gift or souvenir for your loved ones and for yourself and not only for Christmas/Birthday/Anniversary, you can present it at any time, when you want to surprise somebody. ✓ The comb can be engraved with anything you would like to: name, logo, funny inscription, picture etc. Also we can add engraving on both sides of the comb. ✓ Size: Length – 11,5 cm (4.5″) Width – 4,5 cm (1.7″) ✓ The colour of the comb can be a bit different (lighter/darker), because it’s made of natural wood. This is a folding beard and mustache comb; it has been laser cut from alder, in an original, hand-drawn design meant to mimic a controller from the classic NES console. This has a custom option, instead of CONTROLLER over the two “buttons” you can opt for custom text. This could be a name, nickname, hashtag or whatever you’d like…within reason, there is a text-size limit to consider! If you’d like custom text please include it in a note, otherwise you can leave it blank and it will just have CONTROLLER. This would be a nice gift for the gamer in your life, male or female, as the comb can be used for gentle coming of head hair, as well. It features two bamboo “blades”; one with fine teeth and one with the teeth wider spaced to allow some variation while grooming. The body of the comb has a laser-engraved texture for an old-school look. The wood body shown is Alder, finished with organic beeswax. Closed, it measures around 4″ x 1″. The blades come in either bamboo. Typically, wood is always an excellent choice for a comb; it help distribute the natural oils or your facial hair as you groom. It also will help better distribute any purchased beard oils. Acrylic blades that are laser cut are always going to be a better option than a generic, stamped, plastic comb. Plastic combs stamped from molds, more often than not, will have jagged edges to the tines and this can damage your beard. The bamboo we use is a very strong and flexible plywood, comprised of 5 “piles” or layers of alternating grain. The acrylic is cast and has a smooth, glossy finish. Typically, we use 1/8” thicknesses for a single layer of materials unless noted otherwise in the description. Both the body and comb parts are laser cut for a smooth finish. The wooden/bamboo aspects are then hand-sanded in a multi-step process to smooth and even them out, then polished and buffed with a mix of organic mineral oil and beeswax for a smooth, non-glossy finish.